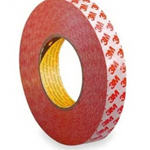 This high quality 3M double sided tape has a high performance acrylic adhesive that will withstand temperatures up to 93C and has good solvent and very good UV resistance. It provides a high level of adhesive peel and shear performance. The adhesive system used on these products provides good adhesion to both high and low surface energy substrates. The excellent initial tack ensures that a bond of good integrity is achieved soon after application. This product is suitable for a wide range of materials including stainless steel, materials like felt and foam, rubber and polycarbonates.